Sari Saltuk Bektashi Sufi tekija, 16th c. CE, Blagaj, Bosnia-Hercegovina – Photograph 2006 by Benko, Via Wikimedia Commons. The world's Muslim believers and the Jewish people have significant aspects common to their traditions -- notwithstanding the persistence of conflict in the Middle East. Jews and Arabs both trace their lineage to the monotheistic prophet Abraham (Ibrahim in Arabic). Jews affirm their descent from Isaac, the son of Abraham and his wife Sarah, and Arabs from Ishmael (Ismail), the child of Abraham's Egyptian slave Hagar. The posterity of Ismail extends, through affiliation with Islam, to many other ethnicities aside from the Arabs, across the globe. Yet, the Quran, the sacred text of Islam, repeatedly praises Moses (Musa), and Muslims, like Jews, believe that Moses alone, among the prophets, spoke directly to God. In addition, Jews and Muslims both circumcise their male offspring, the former at birth and the latter at or approaching puberty. And finally, the two religions share some dietary and other restrictions, such as a ban on consumption of pork. Muslims and Jews further possess mystical customs -- Islamic Sufism and Jewish Kabbalah -- that are so close to one another that the presumption of mutual influence is inescapable. Yet the transmission of these spiritual doctrines and practices between them is still historically mysterious. At certain points, there is evidence for direct influence of Sufism on Jewish spirituality. Elsewhere, the path between the two is challenging to discern. Sufism and Kabbalah alike fall into two general streams: the "theosophical," concerned with explaining the mystical content of the universe and humanity's relationship to God's creation, and the "ecstatic." Both Sufis and Kabbalists ascribe an external and a hidden meaning to their scriptures. But for the "theosophical" mystic, Muslim or Jewish, the mind is concentrated on performance of religious commandments according to their supernatural understanding. By contrast, the "ecstatic" seeks more than a refinement of the soul, and intimacy with God. A leading Jewish author influenced by Sufism, Bahya ibn Pakuda, served as a Hebraic jurist in the Spanish city of Zaragoza during its Islamic period, before its reconquest by the Christians. Toward the end of the 11th century, he wrote a classic of Jewish ethics that is widely read today, The Book of the Direction of the Duties of the Heart. Originally composed in Arabic, the common Jewish language in the period the great historian of Islam Bernard Lewis has called "the Judeo-Islamic" era, Bahya's work drew extensively on the writings of the early Arab Sufis, such as Dhunnun of Cairo, who died c.859. Bahya shared with the Sufis the belief that adherence to religious law would not, alone, secure the perfection of the soul, but that the believer must commit to God in the heart. He was not, however, an ecstatic -- he believed in loving God from a respectful distance. 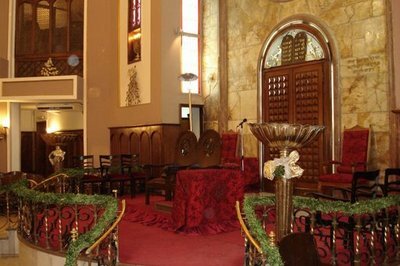 Neve Shalom Synagogue, Istanbul – Photograph 2008 Via Wikimedia Commons. The means employed by the ecstatic Sufis and ecstatic Kabbalists are often identical: absorption in repetition of the Names of God, accompanied by music and physical exertions. The Israeli scholar Moshe Idel, in his 1988 volume The Mystical Experience in Abraham Abulafia, analyzed the biography of a Kabbalist born in Zaragoza in 1240, after it had been retaken by the Christians. Abulafia travelled through the Muslim and Eastern Christian countries before returning to Barcelona, where he began his Kabbalistic studies. His encounter with Kabbalah stimulated him to new and original ways of studying Jewish law that brought condemnation from the Jewish authorities of his time, although he was later acclaimed as a Jewish thinker. Abulafia's methods for attaining ecstatic union with the divine had parallels in Sufism, Eastern Orthodox Christianity and yoga. These included reciting the names of God in combination with "a complex technique involving such components as breathing, singing, and movements of the head, which have nothing whatsoever to do with the traditional commandments of Judaism," in Idel's words. Yet these procedures are widely known in Sufism. Idel notes one element in Abulafia's ecstatic Kabbalah -- a requirement for pronunciation of the divine names while breathing out, rather than taking in air -- and finds a parallel between this and Sufi discipline. In another of his works, Studies in Ecstatic Kabbalah, Idel wrote on "the hypothesis that Jewish-Sufic tradition existed in the East, and likely also in Palestine." Abulafia's ecstatic Kabbalah, according to Idel, fused with "an unbroken chain of [Jewish] authors ... who developed a mystical trend under Sufic inspiration." This trend was "transmitted" from East to West in "a fascinating 'migration' of Kabbalistic theory." The ecstatic Kabbalah that originated in Barcelona came back to Christian-ruled Spain enriched by its encounter with Sufism. Idel concludes, "Palestine made a great contribution" to Kabbalah. "This contribution, ironically, was nurtured by Muslim mysticism." So far Muslims have been less fortunate than Jews in that Sufis continue to be subjected to violent attack by Muslim fundamentalists, while Kabbalah has been assimilated into Orthodox Jewish observance. The religious consciousness shared in dialogue between the Muslim Sufis and the Jewish Kabbalists provides a positive example for the believers in each of the two religions today. We need not idealize this relationship; it may not solve the political problems of Israel and the contemporary Palestinian Arabs. But the links between Islamic Sufism and Jewish Kabbalah deserve to be studied and celebrated, and efforts should be made to resolve the enigmatic history of their parallel and common pathways. Jewish scholars have pioneered in fulfillment of this task; it is time for Muslim scholars to emulate them, from the other direction.